WASHINGTON D.C., June 8, 2009 — Preferred Properties Landscaping has been selected for the 2009 Best of Cheshire Award in the Retail Nurseries category by the U.S. Commerce Association (USCA). 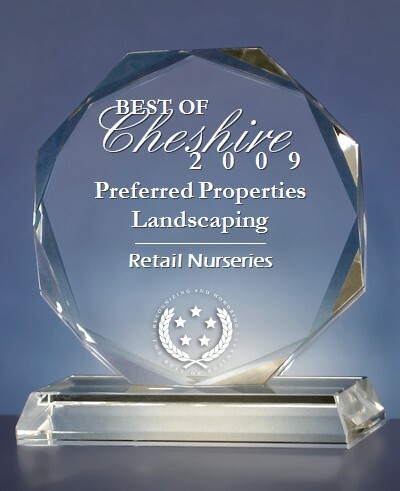 This entry was posted in Best of Cheshire, Cheshire Chamber Best of Best, Cheshire Chamber of Commerce, CT, Preferred Properties Landscaping, Preferred Properties Landscaping and MAsonry, Uncategorized and tagged Best of Cheshire, Best of Nurseries Cheshire, Cheshire, Cheshire Chamber of Commerce, CT, Preferred Properties Landscaping and nursery. Bookmark the permalink.